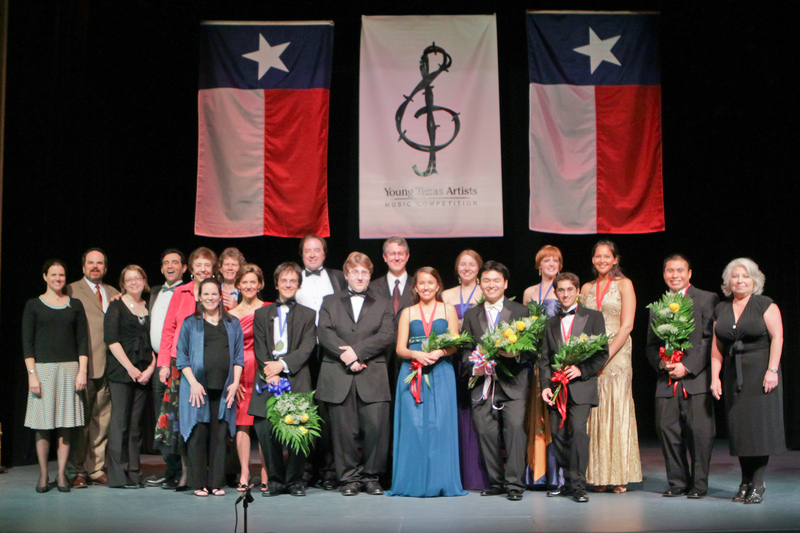 The always-elegant Young Texas Artists Music Competition began with a very special elegance on Thursday evening March 10th, just days before last weekend’s impressive final night of the contest. That Thursday special event was the traditional “Dinner on the Stage,” held at Conroe’s equally elegant Crighton Theatre. The night was designed to honor the prestigious panel of contest judges who assemble from around the country, and along with some special considerations from Carrabba’s Italian Restaurant, the gala night began with a champagne cocktail hour in the theater lobby, and featured delicious hors d’oeuvres. Next, the guests were invited to the stage where a sumptuous Carrabba’s dinner with authentic Texas wines was served. 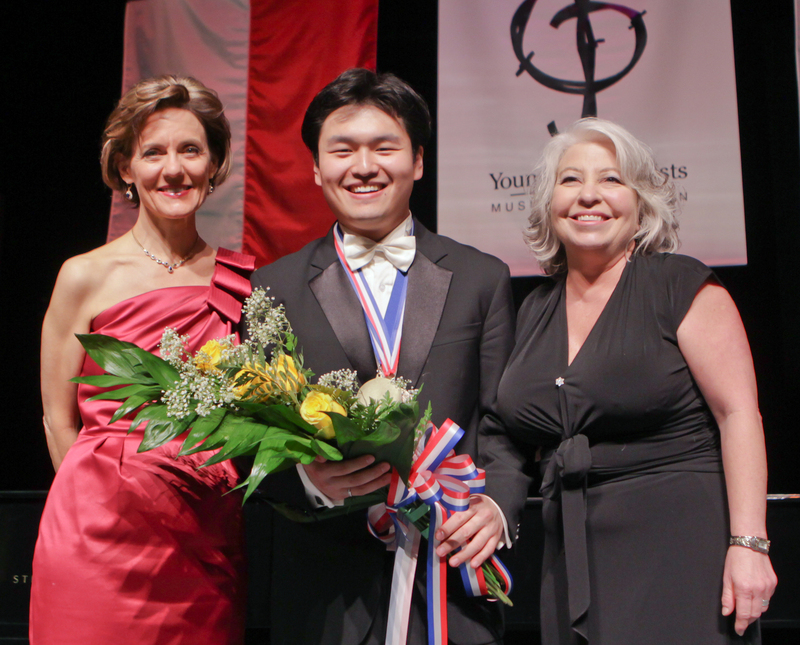 I was privileged to be seated with a charming group that included not only last year’s First Prize winner in the Piano Division, Andrew Staupe, but also one of the renowned judges, Nelita True, Professor of Music at the Eastman School of Music. The other distinguished judges included Becky Brown, Artistic Director of the Da Camera Society of Texas, Daniel Cataneo, faculty member of the Dalcroze Institute at Julliard, Maria Schleuning, longtime violinist with the Dallas Symphony (as well as Artistic Director of Voices of Change), and Roger Pines, dramaturge at Lyric Opera of Chicago. While chatting with Ms. True, I learned that Mr. Pines was in fact born in my little Hudson Valley hometown. He and I then had great fun catching up on details of Peekskill, New York. Meanwhile, once again YTA benefited from the continuing commitment of Artistic Director, Emelyne Bingham, and the seemingly boundless energy of its Committee Chair, Susie Pokorski. She and her equally dedicated husband, Jim Pokorski, did a fine job co-hosting the dinner party which ended splendidly with several classical pieces performed on the Steinway by Mr. Staupe. All agreed that his unique encore of the “Yellow Rose Of Texas,” would be unforgettable. Then, following several days of preliminary competition, it was time for the Young Texas Artists 2011 Entergy Finalists Concert and Awards on Saturday night, with popular radio personality, Chris Johnson, (KUHF’s Afternoon Concert) acting as host. Talent would overflow the stage beginning with the first of the eight finalists, flutist, Masha Popova, student at Rice University. (The music student contestants must be either Texas residents themselves, or they must be studying music in Texas.) Dressed in a soft, strapless gown of elegant royal purple, Ms. Popova’s talented fingers brought both a flitting delicacy and lilting purity to her performance of Mozart’s “Concerto in D Major, K.314 for Flute and Orchestra.” Her fine performance won her the First Prize of three thousand dollars in the catchall category of Winds, Brass, Percussion, Harp and Guitar. Garnering the Second Prize of one thousand dollars in that same category was the brilliant marimba player, Christopher Lucas, a sophomore from Sam Houston State University. He dazzled the crowd as he performed the exotic, “Rhythmic Caprice,” by composer Leigh Howard Stevens. Coaxing sounds of mystery and enchantment from his unique instrument, he demonstrated not only great musical talent, but also remarkable athleticism during his amazing performance. Competition in the Voice Division began with lovely soprano, Vanessa Becerra, a junior at Texas Christian University. She wore a lovely sea-blue gown, and her delightful performance of Donizetti’s, “Quel guardo il cavaliere…so anch’io la virtu magica,” had truly professional polish. She displayed theatrical flair, an easy grace and natural freedom onstage, as well as an instinctive sense of comedy. That merry and confident performance was followed by the lilting loveliness of her second number, “Ah! Je veux vivre.” Her virtuosity was on full display, and with arms outstretched she showed a fearless connection with the audience as she embraced it in more ways than one, going on to win the thousand-dollar Second Prize in that category. The three thousand dollar First Prize would go to mezzo-soprano, Abigail Levis, a second year student at the University of Houston. She was rewarded for her authoritative and full-voiced mastery of Mozart’s “Parto, ma tu, ben mio.” Wearing a glamorous gown of shimmering gold and gray, she also brought considerable comic flair to an amusing and sassy performance of the somewhat unusual and nutty song, “What a Movie,” from Leonard Bernstein’s one-act opera, Trouble in Tahiti. In the popular Piano Division, TCU sophomore Kyle Orth may have been a bit slight of stature, but he was very large in talent when sitting proudly erect at the Steinway. Playing Beethoven’s Sonata Op. 81a, “Les Adieux,” he began with a pensive delicacy, and his crisp and stately precision would then show a great command of the tremendous musical variety of the piece. Next, performing Debussy’s rhythmic and shimmering, “L’isle joyeuse, L. 106,” he skillfully combined a focused intensity with thunderous power. The impressive performance won him the thousand-dollar Second Prize. The three thousand dollar First Prize in this division went to talented Rice University music student, Viktor Valkov, for his skillful performance of Franz Liszt’s, Legend n.2, ‘Saint Francis walking on the waves.’ In the talented hands of Mr. Valkov, the work’s dark and somber opening strains quickly expanded into the rippling power of this complex work. I looked down in wonder from my seat in the balcony as his gifted fingers seemed to literally dance across the keys with fierce accuracy and skill one minute, and incredible delicacy of touch the next. 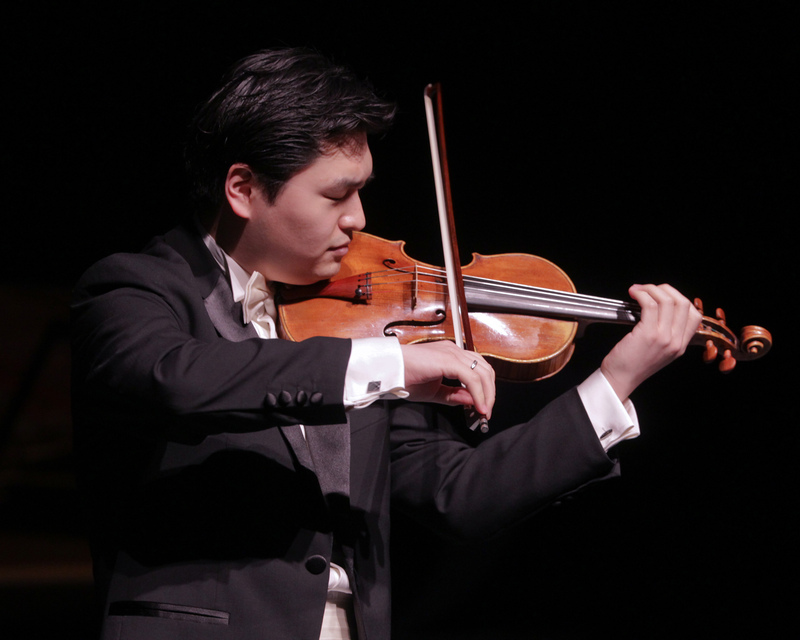 There was special excitement during the competition of the Violin Division. Meredith Riley, a junior at my alma mater University of Texas in Austin, was dressed in a glittering champagne/ivory gown that was quite stunning. But it was no more stunning than her passionate performance of Astor Piazzola’s fiercely sensuous composition, “Le Grand Tango.” Her reward was the thousand-dollar Second Prize. Closing out the evening in truly spectacular fashion was Rice University doctoral candidate, Ying Fu of Shanghai, who was just recently selected as violinist with the Cleveland Orchestra. With dramatic gypsy-like flair and impressive technical virtuosity, he offered Henryk Wieniawski’s “Variations on an Original Theme, Op.15.” Undeterred by the work’s frequent demands for bowing and plucking the strings simultaneously, his virtuoso performance had lilting merriment in parts, with the gifted musician seemingly skipping across the strings during the thrilling conclusion. He must have been thrilled as well when awarded the divisional First Prize of three thousand dollars, the Audience Choice Award of one thousand dollars, and the evening’s Grand Prize of an additional three thousand dollars. For further information on the Young Texas Artists Competition, visit the website at www.youngtexasartists.org . This entry was posted in Concert Reviews, Miscellaneous Reviews, The Courier Columns and tagged classical, competition, concerts, Conroe, contests, Entertainment, Houston, music, Reviews, Texas. Bookmark the permalink.